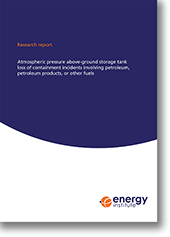 This research report aims to provide an evidence base to inform operators of petroleum, petroleum products, or other fuels bulk storage facilities about the risk of above-ground storage tank (AST) loss of containment (LOC), especially catastrophic tank failures (CTFs), and the likelihood of breach or overtop of secondary containment. These data would assist operating company risk assessments in determining whether there is an evidence-based need to better protect their containment systems, whether primary, secondary or tertiary, using identified risk reduction measures. Critically review, interrogate and analyse existing data sources (e.g. literature and databases) on reported cases of AST LOCs, including those that are considered CTFs. Note that new data collection by operating company surveys was not in the scope of this research project. Assess as far as possible from the available evidence, what proportion of reported AST LOCs are CTFs, and whether there is breach or overtop of secondary containment. Identify as far as possible from the available evidence, what failure modes and failure causes have led to the AST LOCs, especially those primary failure modes relating directly to the AST and its appurtenances. In addition, assess as far as possible from the available evidence, the extent to which these failure modes and failure causes are likely to apply to UK facilities given the design methods, standards, metallurgies and ambient conditions in use in the UK rather than worldwide.